Seawalls are a fact of life for those who live along our many waterways here in South Florida. They protect your property from the water, but many forces place stress on them – tidal action, boat wakes, currents and storm surge all can damage seawalls and shorten their lifespan. 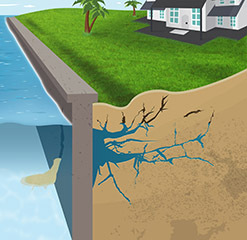 Seawalls contain systems designed to handle water coming from both sides. Over time these systems can degrade or be disturbed by settlement. This can result in loss of soil that causes voids. When signs of sinking ground are observed, it is time for action to protect the seawall that protects your property. 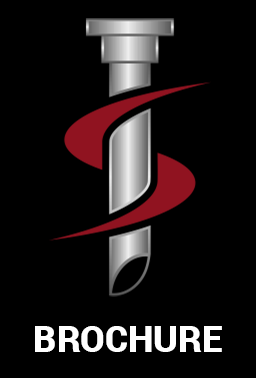 That’s where Florida Foundation Systems comes in. We can assess the situation with a Seawall Inspection and then perform a complete Seawall Repair to ensure a solid foundation. 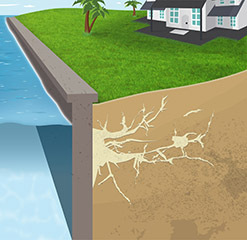 We use a technologically advanced resin that can be injected along the seawall to seal cracks and fill voids. It mixes with the soil to become an impenetrable mass, saving your precious real estate from heading out to sea. When you live along the water, it is a constant battle with nature. The seawall that protects you needs protection too! Our state of the art technology is a fast, clean and painless solution to seawall degradation/erosion. 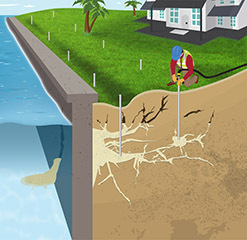 Receive a FREE Seawall Analysis - Contact Florida Foundation Systems today.